Early on Wednesday, a Facebook friend sent me a video of neuroanatomist Dr. Jill Bolte Taylor giving a talk at conference this past March (it’s worth a look). In it Dr. Taylor describes the morning she awoke with a blood clot in her brain causing a massive stroke. Being a brain researcher, she saw the stroke as a great gift for her, and her insights into the event are her gift to us. 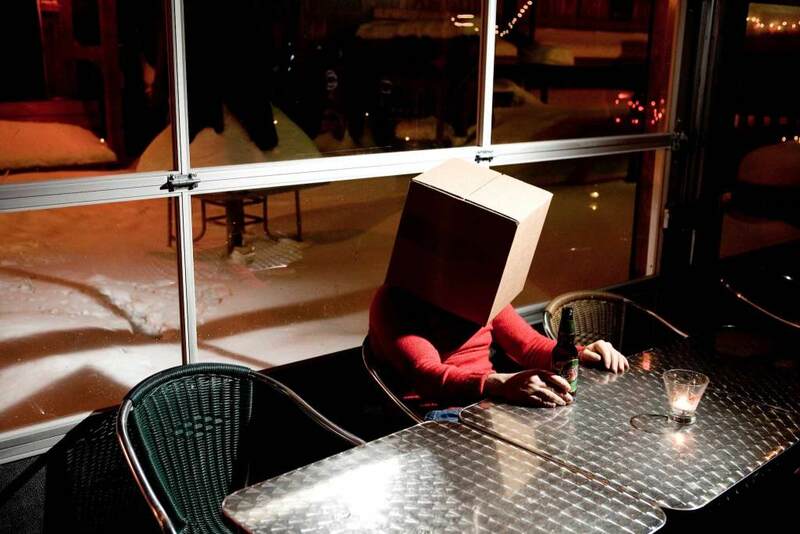 [boxhead] from Toronto based Crow’s Theatre in association with Mammalian Diving Reflex, covers some of the same territory. Dr. Taylor vividly and graphically describes the left-brain/right-brain split (she brings an actual human brain onstage – complete with dangling spinal chord; in [boxhead] we see some other dangling bits). For Dr. Taylor, the left-brain is analytical and completely concerned with the past and the present; the right-brain lives in the present and does not acknowledge consequences of time or temporal reality. [boxhead] begins with a geneticist who is supposed to deliver a talk at a conference. He awakes to find he has a box on his head. Of course, he doesn’t immediately know he has a box on his head, but we do, and the irony begins. Our geneticist and his disembodied narrator – who we see only as a pair of white gloved, blacklit hands floating high above him, underscoring the action with intricate and playful percussion – explores the existential dilemma: he is alone and he has a box on his head. - Wait a second. He didn’t think to clone himself? It doesn’t matter because the accidental result is the same. Instead of becoming twice as big, twice as strong, he just becomes TWICE. Now there are two little geneticists with boxes on their heads for our delight, and two narrators, one for each boxhead, but only one pair of percussioning hands. The play then moves from the existential dilemma to the dilemma of Cartesian dualism, the mind/body split. Our heroes, after all, are Dr. Wishful Thinking, and Dr. Thoughtless Action, although I would be hard pressed to discern their respective personalities from their actions. [boxhead] is performed at high speed, with great energy and skill. Their physical work is top-notch, portraying a range of attitudes and emotions with gestures and postures alone (could there be a mask more neutral than a box?). It is visually entrancing with a lighted frame assisting the magic of light and dark inside the black box. And although there were a couple of glitches with the sound (not quite making the lightning-fast switch from one character to another), the amplification and mechanical differentiation of characters is achieved with a high degree of skill and the percussion is a perfect complement. The geneticists find each other while pursuing the “echoless yell” – a nod to the story of Narcissus and Echo (each scientist has been in a self-absorbed search, occupying their own discrete pool of light until they bump into each other; ultimately, they discover that the ‘other’ is merely a mirror of themselves). When one of the boxheads wants to know his god “as he really is” the plot is similar to Semele’s request to Zeus. While being fucked by the gods is never a good thing, Semele’s union (and immolation) begat Dionysus – the god of wine. The union of boxhead and narrator, by contrast, appears to be fruitless. I was interested by the subject matter, engaged by the presentation and yet it felt light; it felt like dessert. The performance was the second offering of the Magnetic North Theatre Festival’s opening night – the evening began with blood.claat at The Firehall. I had missed the first course; perhaps [boxhead] was conceived as the perfect completion to the evening. As I said, [boxhead] was a delight, a confection, a theatrical treat, but by the end I was still hungry. So what did I want, what was I missing? At the end of the play, the boxheads undergo a transformation (I’m not going to spoil it) and the result maintains the tone of the play: clever, playful and ironic. There is great merit in lightness and playfulness but perhaps I was hoping the tone would change. The channel from irony to sincerity is one of the trickiest, yet most satisfying to navigate. When we wrestle with dualism, we strive to understand the connections in a seemingly divided universe (the “uni” in universe gives it away – it is all one). Watching the Youtube of Dr. Jill Taylor gives us a glimpse of the emotional impact this great struggle can have. For me, [boxhead] never found an emotional core of compassion. There were, however, two moments of theatrical poetry that almost took me away. One was constructed, one at least a little fortuitous. First was the planar kiss of the two boxheads. Seeing flat surface pressed to flat surface, I couldn’t think of anything other than the incredible diversity and beauty of humanity – how heroic it is when we try to connect through the skin to skin contact of a kiss; how all our bumps and contours have to shift and adapt, how we soften our hard edges to let the other in. It was beautiful. The second occurred when a wonderful young woman in the third row succumbed to the necessity of audience participation. She showed courage doing what needed to be done – climbing over the seats, making her way forward – and then when she arrived at the point of expected audience participation, she didn’t just follow instructions, she LEAPT from three or four steps up. In that leap, as she hung in the air, all the thrill of compassion and emotion that I want in the theatre hung there with her, full of courage, rebellion, determination and hope. She was truly out of the box.